Australia has just come out of a period of drought and I live at the end of the River Murray (longest in Australia) where it finally exits to the ocean. The Murray River was being affected by the drought in Australia and water flows are minimal. 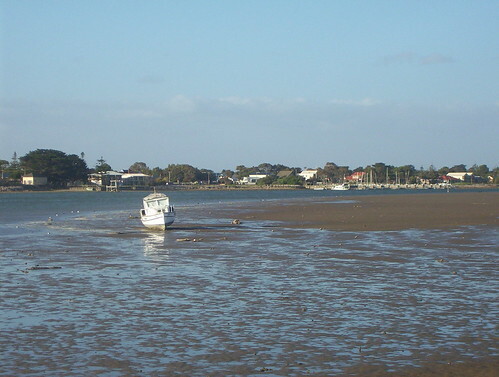 The river level had dropped so much that there were sand banks appearing and the river shoreline was expanding. The water level had changed dramatically. This boat is in the middle of the river and well and truly stuck. Nice pic and a perfect take on the prompt. Thanks for dropping by mine. Hopefully the boat won’t be stuck much longer. Our entry for this week’s stuck is: cats getting stuck in a different way. Great shot of high and dry ! We often see that here in Canada – although it is generally caused by the high tide shifts and not drought! Nonetheless, it is a great shot for this week’s theme which, frankly, had me very stuck! Great example for the two themes. I go for my holidays in Australia and took a boat ride on River Murray with my young son on one of the trips. It was an interesting and fun experience for us who come from a tiny island where tall buildings abound. Even though Australia is an island the land mass area is as large as USA minus Alaska and bigger than Europe. Considering the size of Australia we take up a fair bit of area and across many weather zones. If I were generalise, it seems like the north and northeast is subject to the most floods and and the southeast the most prone to drought. Would that be correct? Well the north and northeast of Australia are in the tropical zones so they have cyclones and monsoon rain so do get a lot more water than the south. Australia also doesn’t have many high mountain ranges per se and is relatively flat across a lot of the land which makes it easy for flooding to spread. Yes, that’s stuck until the water levels come back up… great shot for the theme!! Oh dear that would be a drag (no pun intended). Happy Weekend! Now that is a great example of stuck! !